The sink is a single, seamless unit with a satin polish finish. It comes with an anti drip front edge and ends with a boxed upstand to the rear, with relief patterned drainers. 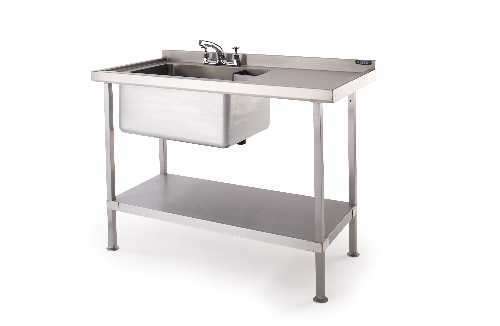 All units come with adjustable feet and a stainless steel undershelf. This sink can be supplied with taps as an option. This sink is 850mm high to the top of the anti drip edge. Comes with tools and instructions for assembly.